I look around at all the rippling muscles, all the focused expressions. I feel out of my league for a minute, then my confidence comes roaring back. I remember that I have finished this race two years ago. 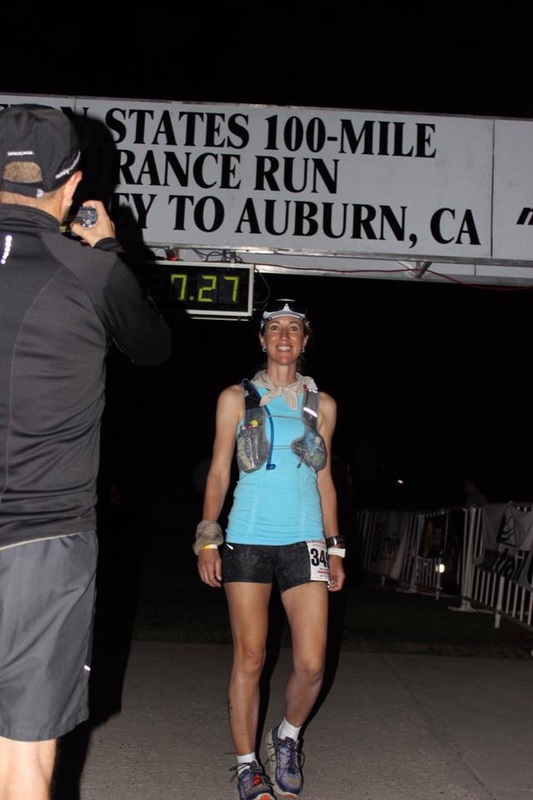 I have run a bunch of other 100 mile races. I want to be here. With five minutes to go, I move up to a place somewhere in the middle of the pack, where I find my friends Ed Thomas and David Hayes. Quick hugs. Nervous smiles. We know that anything can happen between here and Auburn. The shotgun signals the start of the race, and we take off, with the first hint of daylight on the horizon. 1. 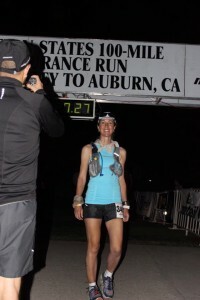 Stick to the 24-hr goal time as closely as possible until the halfway point, then bank some time if possible. 2. Deal with the heat. Use ice whenever and wherever I can to cool down. Keep drinking Nuun electrolytes. Take a salt tablet every hour. 3. Avoid a bonk. Eat 200 calories an hour — clif bloks until I can no longer stand them, then switch to any type of food that still looks appealing. 4. Last but not least: I will practice relentless forward progress. Stay upright. 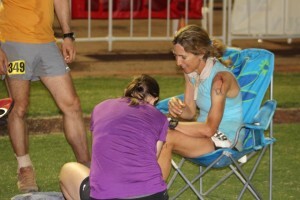 Don’t dawdle at aid stations. Don’t sit down unless changing socks, changing shoes, or doing blister surgery. It sounds simple enough. I hope it’s doable. winding its way down the mountain, through a meadow full of wild flowers. 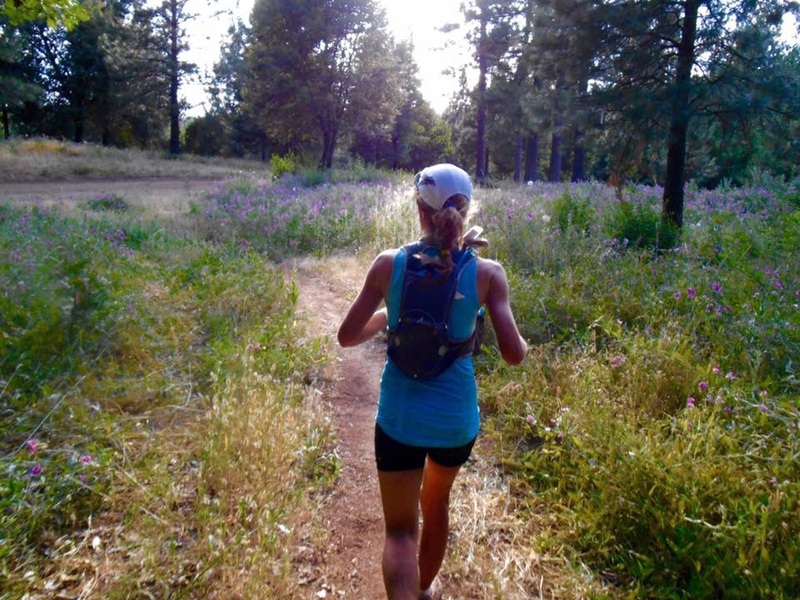 If I really want that buckle – and I really, really want it – I can’t be too cautious on the downhills. At the same time I know I have to be cautious enough not to blow my quads, or to face plant. A fine line. I move at what I think is a pretty decent pace, but pull over a couple of times to let faster runners pass. After twisting my ankle at the Bryce 100 a year ago and a few painful crashes since then, I have lost a lot of my carefree downhill mojo. It needs to come back, but today is not the day to take chances. I am going as fast as I think I can while staying upright. At Lyon Ridge, mile 10.5, I eat the first of the day’s countless clif bloks, starting with orange flavor. Three of them equal 100 calories, every 30 minutes. Easy math. 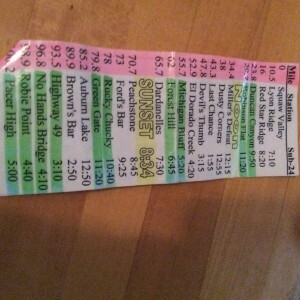 I pull out the laminated cheat sheet with the 24-hour splits for the first time. Thank you, David, for preparing this handy item. It’s much more legible than the handwritten scribbles I had meant to stick into my pack. A thoughtful, very romantic gesture. Three minutes behind goal time. No biggie, but I better skedaddle out of here. It’s still cool, though forecasts predict temperatures in the nineties. I need to make up some time before the heat slows everyone down. The scenery is breathtaking: we move along the Red Star Ridge, up, down, up again. I remind myself to look at the trail in front of my feet more than at the gorgeous views. Anyone who says the Western States course is mostly downhill and not very technical is wrong. 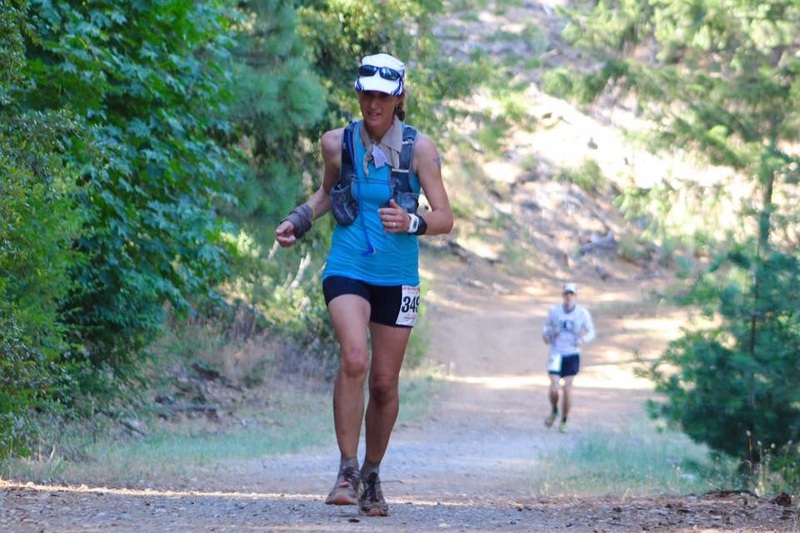 These mountain sections are as technical as notorious ankle twister courses like Zane Grey. It’s getting warm. It’s getting hot already. It’s still early. 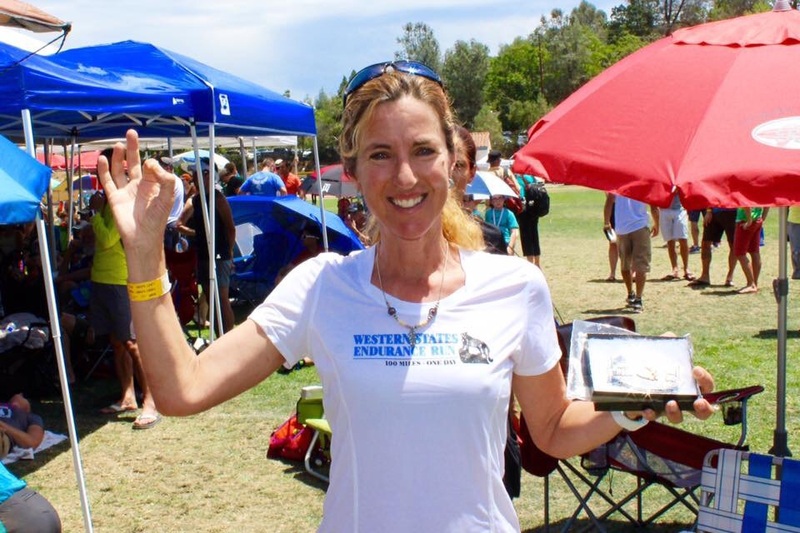 The Duncan Canyon aid station, with its crowd of happy volunteers and mustached, cowboy-hatted announcer, makes every runner feel like a rock star. I get there right on schedule and run away energized, with a mouth full of watermelon, my hat, bra, and bandana full of ice cubes. My crew is waiting at Robinson Flat.I am now a couple of minutes ahead of the 24-hour pace. We are a good team. More clif bloks for my pack, more sunscreen. A reminder to start taking salt, a quick check list: Ice? Nuun? Ginger? Yes, yes, yes. The next time I see David, Michael and Sara, it will be late afternoon. I run out, iced, energized, and right on target for a 24 hour finish. 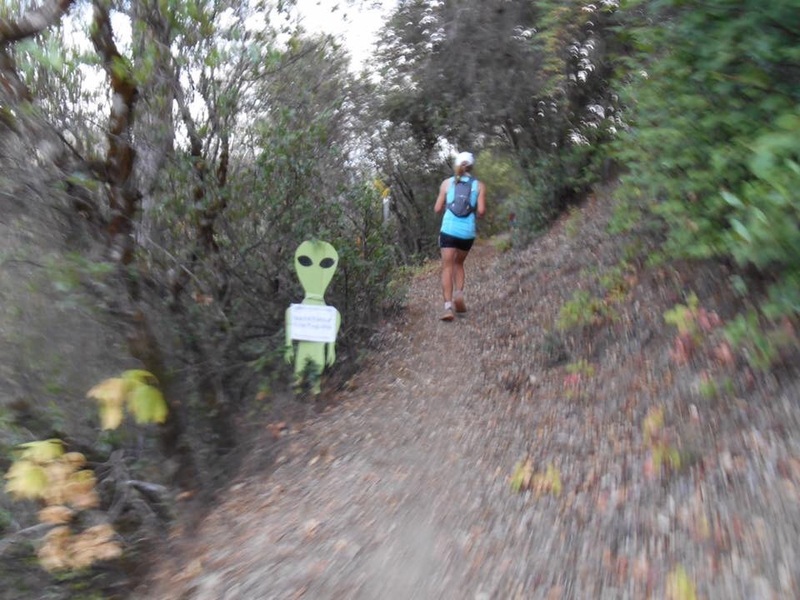 But it’s only mile 30. The canyons lie ahead, with their steep climbs and sweltering, oppressive heat. The names of places along the route become more and more ominous, more and more dire. They echo hard times, broken dreams, lost hopes; Millers Defeat, Last Chance. Dusty Corners really is a dusty corner. I cough. Sweat stings my eyes. Through the curtain of salt and reddish dirt, I imagine ghostly apparitions of bearded men in tattered clothes leading emaciated burros packed with gold pans and mining gear. 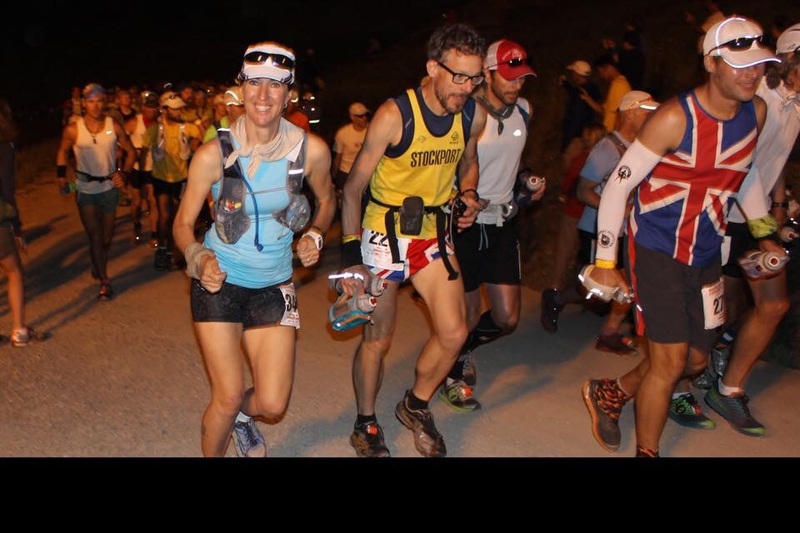 They had no aid stations, no ice cubes to slide down their shirts, no hydration packs. I feel grateful for modern times. The climb up Devil’s Thumb is as steep as I remember it. I also remember its many false summits. One foot in front of the other. 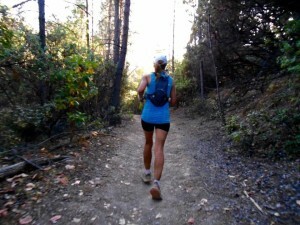 I hike at a steady pace, reminding myself that it’s only a couple of miles. Though I move slowly, I pass a runner who has stopped, then another. Cheers from above mean the aid station is close. I soak my bandana, but can’t soak the rest of me. There are no ice cubes. This aid station is so remote that water is strictly rationed. I notice the difference on my way down the Eldorado Canyon. My core temperature goes up, and my stomach goes on strike. It’s the middle of the afternoon, and it feels like we’ve reached triple digit temperatures near the bottom. An oven, an inferno. A hot breeze offers zero relief. For the first time today, I really suffer. 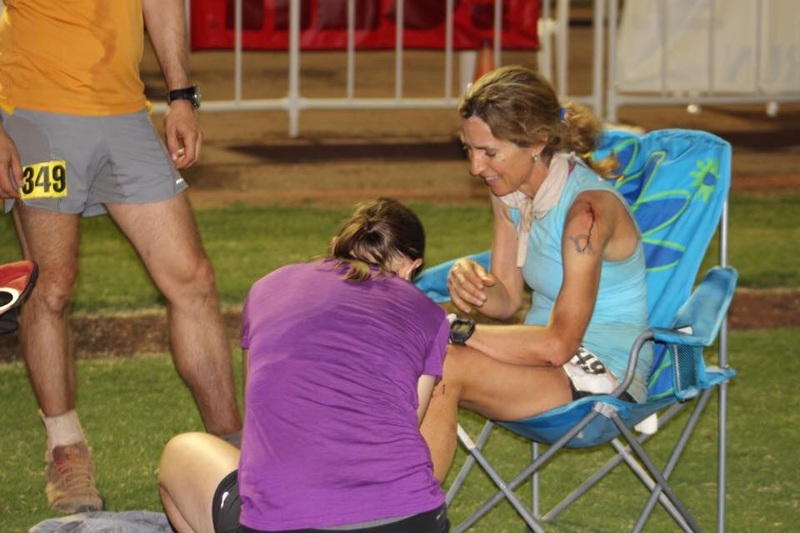 Thankfully, the Eldorado Canyon aid station has plenty of ice, and plenty of water, for drinking, and for the ultra runner’s idea of a wet t-shirt contest. I gulp cold, fizzy ginger ale, which settles my stomach. I refill my pack, adding watermelon-flavored nuun for variety. I force a few more clif bloks down my throat. I check my cheat sheet, worried about the 24 hour goal time. To my surprise, I’m still on track at this point, just a little past the halfway mark. A few minutes ahead of schedule, even. How can this be? I suffered, yes, but others must have suffered more. A woman who looks a lot faster than me is vomiting into the bushes near the Eldorado Creek. A bearded guy sits in a chair, head between his knees, a wet towel around his shoulders. The misfortune of others has a way of making me feel less bedraggled. I stay long enough to cool off a little, but head on out as soon as my body has reached a point where the red light signaling an imminent warp core meltdown no longer blinks. The climb to Michigan Bluff is longer than the one to Devil’s Thumb, but not as steep. I feel strong again running into Michigan Bluff. Mile 55.8, David tells me I am 15 minutes ahead of schedule. I sit down to treat my first blister of the day. No wonder, really. My feet have been wet since this morning, not because of water crossings, but because of all the water I have dumped over my head and down my back. Inevitably, some of it has soaked into my Hokas. David, Michael and Sara towel off my feet, help me patch up the raw spot, help me put on dry socks. I feel humbled, and deeply grateful as I exit. Six miles until Foresthill, where David will start pacing me. It’s late afternoon. The sun has lost a little of its force, but it’s still hot. My stomach starts to complain about the clif bloks. I try to choke down one more, margarita flavored because of the salt, but have reached the end of my clif blok tolerance. I’m low on calories, and low on energy. Everyone says that the hard part of the race is over by Michigan Bluff. They neglect to mention Volcano canyon, a smaller version of the other canyons, but a canyon nonetheless. I lose some of my time cushion on the way to Foresthill, but get there still seven minutes ahead of schedule. My super crew has set up a chair before the actual aid station. Another blister intervention, another sock change, another bandana soaking, a few more ice cubes down my bra. Ice-cold coke, the rocket fuel of late, hot ultra miles, gives me new energy. David is wearing his pacer number. We exit at a brisk pace, marveling about how organized, how efficient we are. About two miles later, I realize that my lights are still in my drop bag. Aaaaaargh! What a dumb rookie mistake. Wait, I am not a rookie. Even when I was a rookie, I remembered important stuff like lights. I am a week away from my 45th birthday. Am I going senile? So much for efficiency. Having a crew does not mean my brain is excused from thinking. I try to stay positive. David has his head lamp, which he now gives to me, so he can’t be accused of muling. Michael and Sara have picked up my Foresthill drop bags. They (and my lights) will meet us at the river crossing. If we keep our pace, which is still pretty decent, we’ll only have about an hour of darkness to worry about. California Street is smooth, shady, inviting. I can still run, though my quads are hurting. It’s a beautiful evening in the forest. I tell David this is one of the most romantic things we’ve done in 22 years of marriage. The shadows grow longer, the green leaves fade to light grey, then to black. I turn on my head lamp. David tries sharing the beam, but this is a low-lumen backup lamp, barely enough for one runner. He falls back, turns on his iphone flashlight. I feel torn: should I be a good wife and stay with him? 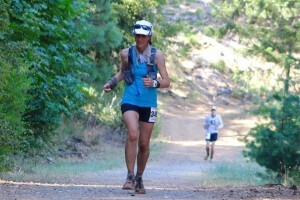 Or should I be a badass ultra runner and chase that silver buckle? David tells me to go for it. I hesitate for a split second, then abandon the poor guy, hoping that the mountain lions don’t feel too hungry tonight. The tiny speck of iphone light fades behind me. The sugar rush from the Foresthill coke has worn off. I have stayed upright through the rocky, technical terrain of the early mountain miles and the steep climbs in and out of the canyons. Now, on the smooth, rolling doubletrack, I trip over a rock the size of a peanut and fall to my knees with a graceless thud. I dust myself off and keep going. The final stretch down to the river. My quads are unhappy, but unlike two years ago, they still function. Michael hands me my good head lamp and reminds me to eat something. I switch to liquid nutrition, i.e. soda: a cup of ginger ale, a cup of coke. Not ideal, but any calories are better than none at this point. Sara offers to go rescue David while Michael and I wade into the American River. The cold water feels good on my legs, but the current is stronger than I remember. We wear life vests and hang on to the rope, which is not overkill: the water is waist deep, with slick boulders underneath. I slip. One of the volunteers expresses concern about my mental state. I reassure him: only my body is giving out, thank you. Dry shoes await on the far side. My blister has multiplied. It’s become a happy blister family. We patch up my feet one more time, then hike up to Green Gate. It’s 10:57 p.m when we get there. By some miracle, I am once again 20 minutes ahead of schedule. But I know I need to keep running, and I need calories to do it. “Could you eat one more clif blok?” Michael asks. I tear open another package. I look at the clif blok. It looks back at me, greenish and gelatinous. I shake my head. My stomach says it’s done for the day. We get to Green Gate, where I drink some chicken broth from a styrofoam cup and chase it with a ginger chew. Better than nothing. Off we go. No fuel means no coordination. I fall twice, scraping my knees, hands, and even my shoulder in the process. The good thing is, I hurt so much everywhere else that the pain barely registers. Auburn Lakes Trail, mile 85. 27 minutes ahead of schedule. I eat a boiled potato coated in salt. It helps. Michael and I joke that we might finish in under 23:30 if we hurry. I want that silver buckle. I haven’t thought about anything beyond this goal. But now I get ambitious. 23:30? Am I in the top 20? Let’s go do it! 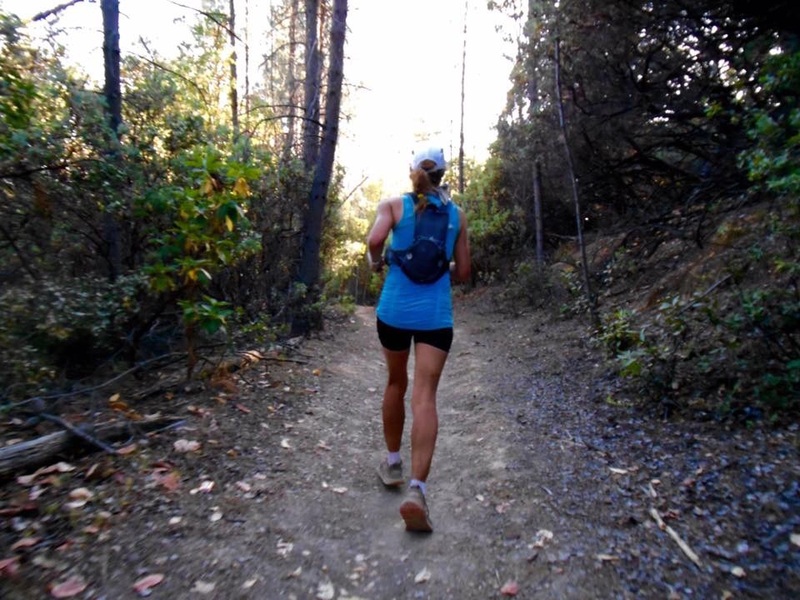 We hike uphills, run everything else. I had forgotten how much uphill is hidden in this downhill course. Mile 90. We climb, yet again. Michael is an excellent pacer, sensitive to the mood fluctuations of 100/mile runners. We make jokes, run in silence, engage in deep conversations. Mile 93.5, the Highway crossing. David and Sara meet us. They’re excited because I am now 29 minutes ahead of schedule, and in 16th place. I’m excited to find that neither of them has been eaten by a mountain lion. The niggling worry in the back of my mushy, sleep-deprived brain calms down. Another piece of potato, more salt. Sara asks. The chair beckons. So does the silver buckle. I ignore the chair. One more Nuun refill for my pack, a couple more ginger chews for the last few miles. Off we go. No Hands bridge is lit up like a Christmas display. Beautiful, but no time to stop. Another cup of coke. Mile 96.8. I start to think about the finish line. One more climb to Robie Point. A horse at the end of a long ride can smell the barn. I smell the silver of my dream buckle. A beautiful scent. Sara meets us at the top of the hill. “The stadium is right around the corner!” she reassures me. The three of us run. My quads protest. I tell them to shut up. I dig around for last reserves of energy. This is how a car runs on fumes, way below the empty mark. The stadium gate. 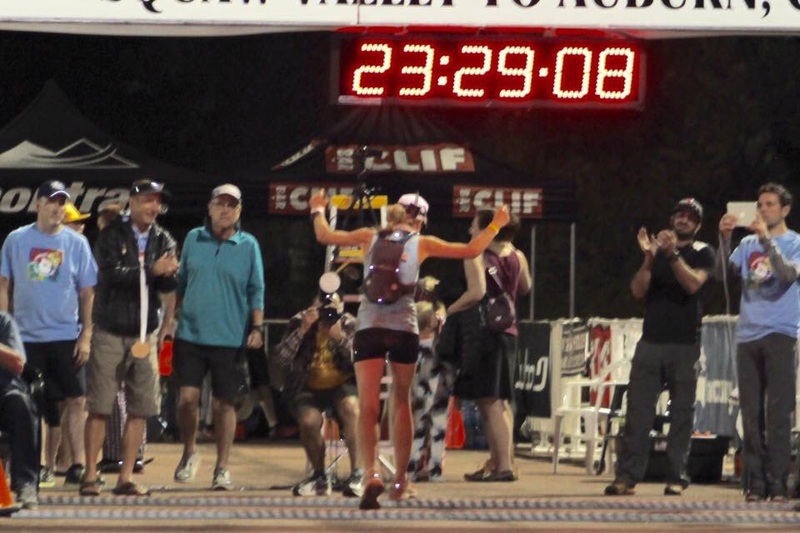 I see the clock and sprint: 23:29:08. Wow. 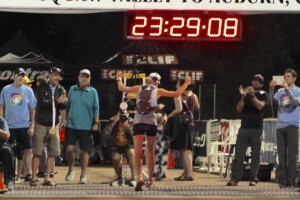 Sub-23:30, 15th woman. It takes a minute to sink in, and I let it sink in as David helps me sink into a chair. I wanted the silver buckle. I wanted to be in the top 20. I did better than that. Yes, I ran hard. I had a good plan and stuck to it. But I couldn’t have done it without David’s unwavering support through it all. 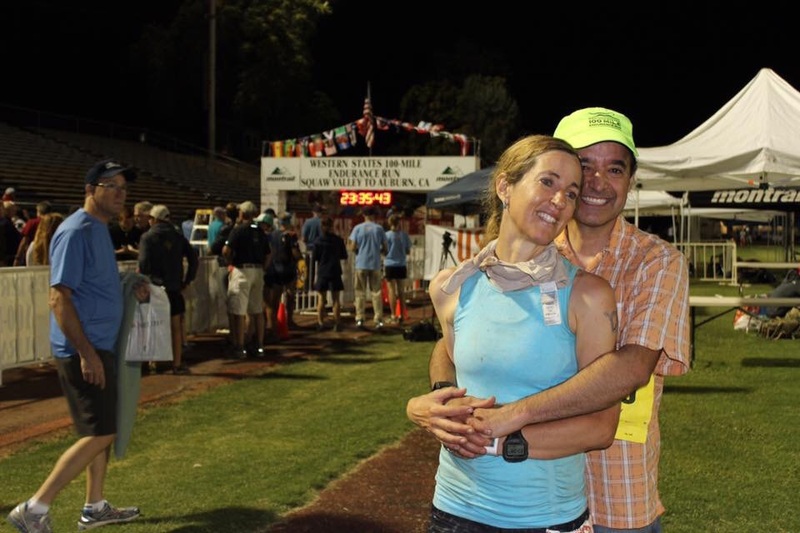 He cheers me on during every crazy event I sign up for, tells me I look good at mile 93, and – this is huge – does not complain when I leave him alone in the dark on the Western States Trail, with only his iphone to light the way. 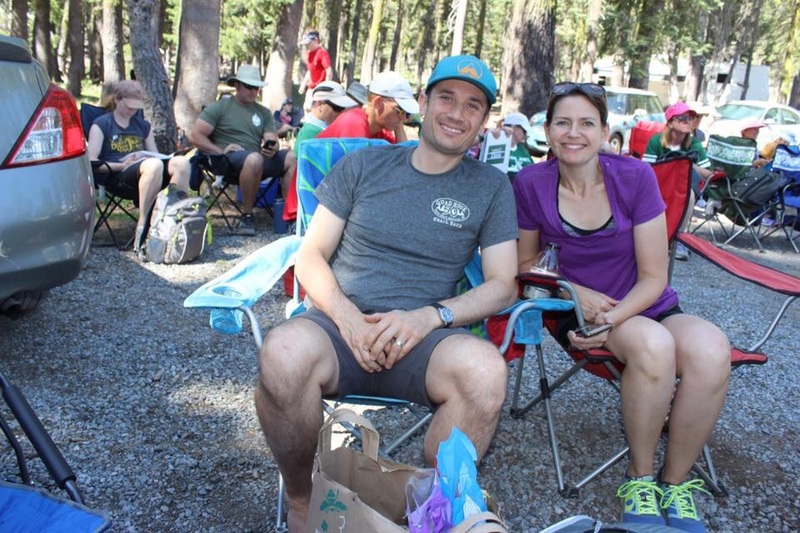 I also couldn’t have done it without Michael and Sara, who volunteered their weekend to cheerfully pop my giant blisters, hang out at aid stations, lose tons of sleep, and look like they had fun doing all this. Thank you for helping me make this dream a reality. I hope to repay a little of your kindness at Sara’s first 100, or Michael’s next one. 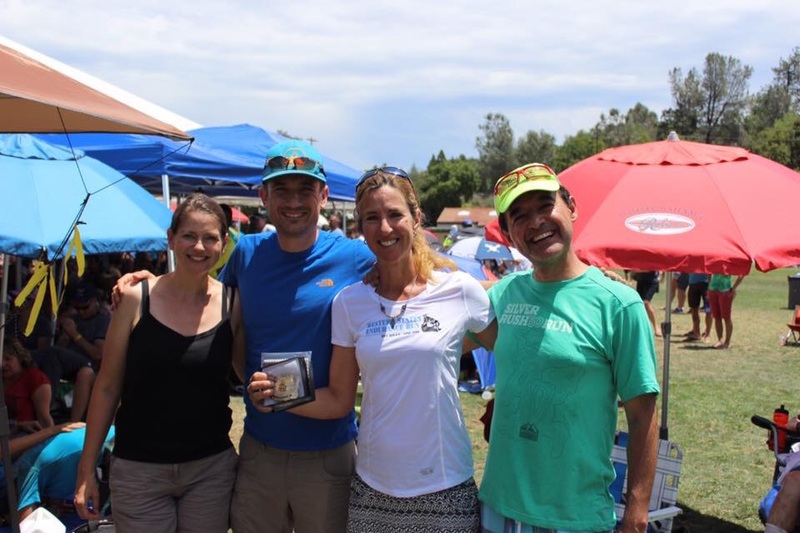 The trail running community is a good, genuine, friendly place to be. Thank you, Western States RD and all the volunteers for organizing such a spectacular event. Thank you, everyone from the bottom of my heart. A week later, in the fading afterglow of this amazing experience, I am already beginning to wonder: if I get in again, could I run this course even faster? There is only one way to find out! This entry was posted in Uncategorized on July 7, 2015 by silvakat. 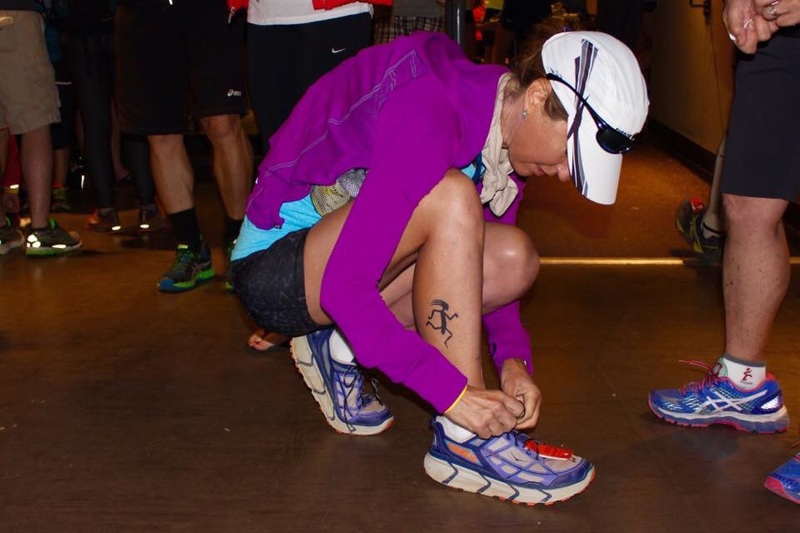 All I can say: great job Katrin, you are indeed a badass ultra runner.